Whether you want to call it an audio interface or a soundcard, if you make music on a Mac, PC, iPad or even iPhone, it makes sense to get the best box of I/O tricks that you possibly can. But how do you decide which USB audio interface you should buy in 2019, or even if you should buy a ThunderBolt audio interface for your home studio? Well, the product for one person might not be the best one for another. Firstly, you need to decide how many audio inputs and outputs you need. If you're going to be recording lots of instruments at the same time - in a band, for example - then multiple inputs will be very useful, but if you just plan on plugging in a mic or guitar once in a while, a 2-in device will be sufficient. If you're a DJ, you'll want an audio interface that lets you cue-up tracks on headphones while the main mix plays out through your speakers. Think about MIDI connectivity, too - do you plan to plug your MIDI controller directly into your computer over USB, or would full-size MIDI ports on the interface be useful? Then there's the issue of how the interface connects to your computer. A majority of models work over USB 2, but you'll also find ThunderBolt interfaces that promise better performance but typically cost a little more. We're also starting to see USB-C audio interfaces coming to market. Whichever you go for, make sure it's compatible with your PC/Mac/iOS device and DAW before you buy. You also need to decide if you want DSP (Digital Signal Processing) in your interface, which will enable you to use dedicated plugins that won't place any load on your computer. Universal Audio, with its UAD products, is the undisputed king of this market, but there are other options, too. Form factor is a consideration, too: is your interface for the studio or do you want to take it on the road with you? Audio interfaces comes in all shapes and sizes; some are designed to sit in a rack or on a desk while others can be stuffed in a laptop bag and taken anywhere. Finally, but crucially, there's the issue of price. You can get a decent audio interface for well under $200/£200, but spend a bit more and you're likely to see better quality, performance and specs. So, there are lots of great audio interfaces, but which one you should buy depends on your requirements and budget. Whether you're looking for the best cheap audio interface - the Audient iD4 is our current recommendation - or something from the top end, read on for MusicRadar’s picks of the current crop. Arguably the best audio interface you can buy for less than $200, The iD4 is a simple two-input/two-output offering featuring a mic preamp - complete with phantom power for using condenser mics - as well as an instrument level DI for plugging in your guitar or bass. On top of this, there’s a main output for your speakers and dual headphone outputs. The whole thing is powered via USB and, with Apple’s camera connection kit, it can also work with an iPhone/iPad. However, the studio devilry is in the detail; Audient has really thought about everything with value and usability in mind, making what is a budget solution feel anything but inexpensive. The best USB audio interface we’ve seen at this price for a long time. With high-quality Onyx mic pres, balanced analogue connectivity and operation up to 24-bit/192kHz, the bus-powered Onyx Producer is more than capable of getting clean signals in and out of your DAW. There are two identical mic/line inputs with combination XLR/jack connectors. Each has a manual green backlit switch to select a Hi Z instrument, and there’s a global backlit switch for 48V phantom power. Input signals can be monitored with zero latency using the Input/DAW Mix knob, and rounding off the front panel are a large Monitor level knob and headphone output with level knob. Round the back you’ll find a pair of 1⁄4-inch jacks for the monitor output, and also a pair of MIDI connectors (In and Out), which is very handy. Throw in the robust metal case and you’ve got a compact, workhorse device that should last for years. You get a DAW - Tracktion T7 - in the box as well. A couple of years ago, Focusrite’s original Clarett interfaces introduced premium quality mic pres, ISA transformer mic pre mode (Air) and super-low latency operation at a great price. They also required a Thunderbolt-equipped computer - fine for Mac users, but not for Windows. Thankfully, the Clarett Thunderbolt interfaces are now joined by USB versions. Much like the Thunderbolt version, the Clarett 4Pre USB is an 18-input, 8-output interface with MIDI I/O. On the input side, that’s achieved via two combo mic/line/instrument inputs, two combo mic/line inputs, four line-level inputs, stereo S/PDIF and eight channels of ADAT optical. Meanwhile the eight outputs comprise four line-level and two stereo headphone outs. A great all-rounder, the addition of USB brings this high spec’d yet reasonably-priced audio interface to a wider audience. The iRig Pro Pro Duo is IK Multimedia's best mobile audio interface yet. It's got everything you need from a two-channel audio interface - MIDI, phantom power, direct monitoring, signal metering, combi XLR/Hi-Z inputs - and can be either battery- or mains-powered. The Pro Duo also feels more robust than some of its predecessors. The unit comes complete with a plethora of cabling for connecting to your devices of choice, including MIDI breakout cables. One thing we did notice was that, as the batteries ran down, the unit became less stable. This is, of course, only a minor gripe, but if you're out and about, remember to bring spares. Other interfaces with similar levels of I/O are available for substantially less. AudioFuse is an attractive and portable Mac, PC and iOS-compatible interface with a raft of features. Despite its compact frame, there’s plenty of connectivity on offer. Along the front edge, you’ll find combi inputs and two fully independent headphone feeds. In turn, these can accommodate both mini-jack and 1/4-inch plugs. At the back, there are speaker outputs for two pairs of monitors, line level connectors, MIDI In/Out ports (which, due to size restrictions, have been replaced by mini-jack connectors, which you’ll find in the box) and - for digital interfacing - both S/PDIF and ADAT In/Out. There are also inserts for inputs 1 and 2, allowing you to track through hardware compressors or channel strips. AudioFuse connects via USB 2, but USB connectivity goes further; Arturia has built a USB hub into it, providing three extra USB ports. AudioFuse provides a beautiful and contemporary approach to USB audio interfacing with a great design, compatibility with a huge range of possible audio sources, a great sound and a highly tactile control set. Still a desktop-format 2-in/-6-out interface with 24-bit/192kHz capabilities, the Apollo Twin MkII would be almost indistinguishable from the original were it not now black rather than silver. It connects to your Mac or PC via Thunderbolt (there’s no cable in the box), but it has to be powered from the wall. The back panel and front edge house the inputs and outputs, while the top panel centres on a satisfyingly oversized knob. Also a DSP box for powering UAD plugin effects (you can choose from Solo, Duo and Quad options), the Apollo Twin MkII features the same game-changing Unison preamps as its predecessor, fed by the Mic/Line and Hi-Z ins. These enable a gradually expanding subset of UA’s classic hardware emulation plugins to be inserted directly into each input path. This is a musically empowering hardware/software hybrid that's capable of elevating even the humblest of home and project studios to genuinely professional-quality heights, and certainly one of the best audio interfaces you can buy. Antelope doesn't tend to scrimp on the quality of its products and the Zen Tour is no exception. It’s very compact given how much functionality it offers, and feels solid. It has a small but useful touchscreen which enables you access to all the basic functions of the unit, with the likes of input gains, headphone levels and talkback directly accessible using buttons on the front panel and the large 'soft' knob. At the front are two headphone outs, two re-amping outs and four line/Hi Z inputs, all on 1/4-inch jacks. To the rear are four dual XLR/1/4-inch inputs, two pairs of monitor outs on 1/4-inch jacks, eight analogue outs on a DB25, two RCA sockets for S/PDIF in and out, a power connector and USB and Thunderbolt sockets. On the left-hand side are two pairs of ADAT ins and outs. Once you have the software installed on your computer and connected you are ready to go. There are six amplifier emulations covering vintage to modern and clean to downright filthy. They sound great and, unlike some software emulations, have a great dynamic response. You also get a great range of EQs and a single compressor. If you want a high-quality audio interface for studio, rehearsals and gigs you have to look at this. It sounds great and is supremely flexible. Certainly one of the best audio interfaces for guitarists you can buy. One of the best audio interfaces for Mac on the market, the Element 46 prioritises function over form: it’s an extremely simple and rather plain-looking unit with not an LED or LCD in sight. Don’t let the featureless look throw you, though - the (optional) Remote Control unit might look like the more interesting piece of kit, but that plain grey box plays host to the real action. The real ace up Apogee’s sleeve is that the Element interfaces aren’t actually designed for physical interaction at all - instead, they’re designed to be put to one side on a surface in your studio, with their microphone connections (front-mounted for convenience) the only part you’ll get hands-on with during the recording process. Everything else is handled by software, with that aforementioned Remote Control or a free iOS app providing extra hands-on interaction should you wish. While nearly all of the best audio interfaces now provide software control over hardware, Element Control goes further than most, providing an essential front end to Apogee’s superb preamps and A/D conversion. Steinberg has entered the Thunderbolt audio race with the the AXR4, a rack-mountable interface aimed at professional producers and engineers. This 28-in/24-out box offers latency-free DSP-powered monitoring and effects, stacks of I/O and plenty of routing flexibility. Up front you’ll find four Neutrik combo inputs and two headphone outputs, while the back panel houses eight TRS line inputs, eight TRS line outputs and two sets of ADAT I/O doubling as S/PDIF. The second pair provides an alternative AES/EBU Sub-D connector. MIDI I/O sits alongside word clock I/O, while two Thunderbolt 2 ports enable computer connection and daisy-chaining of up to three interfaces. The four hybrid mic preamps benefit from refined transformer circuitry and Rupert Neve Designs SILK processing, while DSP effects include the VCM 276 compressor, VCM EQ601, the Sweet Spot Morphing Channel Strip and the REV-X reverb. Quality oozes from every pore; there’s a new contender in the pro audio interfacing arena. 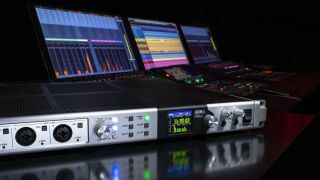 Prism Sound has quickly developed a reputation as a go-to choice for many professional users and studios seeking exemplary audio quality at the interfacing stage. Atlas is a 2U USB interface with plenty of I/O possibilities, but the extra ace up its sleeve is an MDIO port, which provides additional, flexible interfacing capability. The rear panel shows the internal interfacing capabilities Atlas offers, with eight coveted Prism Sound preamps provided, which allow for either XLR or TRS connections, alongside eight dedicated balanced 1/4-inch outputs. You'll also find digital inputs, with supported formats including S/PDIF and ADAT, meaning that Atlas is capable of recording up to 18 channels at once, at up to 192kHz, though digital track count becomes lower at super-high resolution. In use, Atlas feels like a thoroughbred interface from the moment it's up and running. You can configure some settings from the front panel, but Prism Sound also provides a comprehensive Control application to allow you to set up Atlas's assorted I/O over software. Atlas is a sumptuous interface, offering unparalleled sound quality. Prism Sound's reputation is further enhanced with its arrival and, since the quality of its interfaces was already seen as excellent, that's a glowing endorsement.